This is the second post in a brief series looking at the philosophy of mental illness. As noted in part one, some people are suspicious about the concept of mental “illness”. To call something an illness is to deem it worthy of medical scrutiny and treatment. This makes sense — so they argue — when dealing with things like broken bones, viruses, clotted arteries, bacterial infections, cancerous tumours and so forth. They all involve clear, objectively assessable physical effects and causes. Mental illness is not the same: it involves more nebulous, less tractable effects and causes, ones that are not always open to the same level of objective assessment. In part one, the mouthpiece for these suspicions was Thomas Szasz, a trained psychiatrist who has repeatedly challenged the legitimacy of his own profession. The suspicions of Szasz seem to have been confirmed by a series of controversial experiments on the reliability of psychiatric diagnosis. Perhaps the most infamous of all these “experiments” comes from the work of David Rosenhan. In the early 1970s, Rosenhan recruited seven “pseudopatients”, each of whom was perfectly sane and had no prior history of mental illness. The patients (along with Rosenhan himself) presented themselves to different psychiatric institutions, complaining of (vague) auditory hallucinations. Apart from this they acted normally. In all cases, the patients were admitted to the psychiatric institution, and often forced to stay there for extended periods (two months in Rosenhan’s case). They were also diagnosed with different mental illnesses, schizophrenia in most cases, bipolar disorder in one. Experiments like this — and there have been others since, particularly ones casting into doubt the reliability of diagnoses between different psychiatrists — add fuel to the fire of anti-psychiatry. If psychiatrists can’t correctly distinguish the sane from the insane, or even agree on the diagnoses among themselves, then surely theirs is not an objective, value-free form of medical practice? Rather it is, as Szasz has argued, a value-laden enterprise, concerned with labelling and identifying socially deviant thought and behaviour. Maybe, but in many cases the results of experiments like these are never properly contrasted with the reliability of other medical diagnoses. What little research I have done on the matter, suggests that the inter-rater reliability of psychiatric diagnoses is at least comparable to, and sometimes better than, the reliability of other medical diagnoses. For example, Pies (2007) highlights the fact that the reliability of ischemic stroke diagnoses by neurologists lags significantly behind the reliability of schizophrenia diagnoses, and yet no one calls into the question the classification of ischemic stroke as a medical condition. This raises two interesting issues, each of which will be explored in the remainder of this post. The first is that the distinction between mental and physical illness, which Szasz was so keen upon, may be more elusive than we first thought. There may instead be important commonalities between both kinds of illness that need to recognised in our conception of “illness”. The second is that this may force us to address the value-laden nature of all medical diagnoses. We will look at both of these issues. The first by examining Robert Kendell’s account of illness; the second by considering Fulford’s “logical geography” of medical diagnoses. In the mid-1970s, Robert Kendell offered a definition of illness in general, and mental illness in particular. The definition addressed the concerns originally raised by Thomas Szasz. As we learned in part one, Szasz thought that the problem with mental illnesses was that they involved deviations from social/psychological norms, not harms to the physical structures of the human body (like other medical illnesses). As Kendell saw it, this approach relied too heavily on an outmoded “lesion”-based theory of disease, i.e. on the view that illnesses and diseases were linked to particular, discrete physical causes. This approach was, in Kendell’s words, “outmoded beyond redemption”, but nothing had yet been erected in its place. (b) is biologically disadvantageous to the person with the condition. As you can see, the BDDN-account requires that two conditions be met before something counts as a medical illness. The first condition is the deviation of some parameter from a statistical norm. The term “parameter” is deliberately vague, and can cover any discernible sign or phenomenon. In the case of something like, say, blood pressure, the parameter in question is the measure of systolic blood pressure relative to diastolic blood pressure. When these measures are taken from a sufficiently broad sample, we can establish a statistical norm for blood pressure. A deviation from that statistical norm would meet the first condition of the BDDN-account. In the case of mental illnesses, the parameters in question would be things like thought patterns, moods, appetite, sleep, affect and so forth. It may be more difficult to establish statistical norms for those parameters. The main problem with the first condition is that, if left on its own, it would render our definition of illness horribly over-inclusive. If all it took for something to count as a disease was that it involved a deviation from a statistical norm, then someone could be classified as having an illness if they were excessively tall, or had very large feet, or a high IQ. That’s why the second condition is included: the deviations in question must also be biologically disadvantageous. Unfortunately, Kendell was not clear what he meant by this concept, though one can infer from what he said that it related to Darwinian notions of survival and reproduction. In other words, X was biologically disadvantageous if it reduced life expectancy or fertility. (2) At least some of the classic mental illnesses (schizophrenia etc.) meet both conditions. (3) Therefore, at least some of the classic mental illnesses are illnesses properly so-called. Schizophrenia, manic depressive illness, and also some sexual disorders and forms of drug dependence, carry with them an intrinsic biological disadvantage, and on these grounds are justifiably regarded as illness; but it is not clear whether the same is true of neurotic illness and the ill-defined territory of personality disorder. Maybe that’s fair enough. Maybe we should be guided by a principled definition here, not by what has, as a matter of fact, be classified as a mental illness. Those historical classifications could be wrong after all. This suggests that when it comes to the assessment of Kendell’s argument, attention should focus on premise (1), not premise (2), for that is what provides us with our principled classification. So what can be said in favour of premise (1) and the BDDN-account? In his discussion, Thornton singles out two major virtues. First, the account is general, and so not biased in favour of the physical or mental. Second, it offers a purely factual test for whether or not something counts as a disease: does it increase mortality or reduce fertility? This might be thought to satisfy the yearning for “objectivity” among some participants to this debate. Still, the BDDN faces significant hurdles. One major problem is that the addition of the biological disadvantage condition may render the definition under-inclusive. That is to say, it may exclude things that are diseases properly so-called. For example, minor infections might be properly included within the remit of medical attention and scrutiny, but may not actually reduce fertility or increase mortality. The other problem is that, far from being objective and neutral, the definition may simply sneak controversial evaluations in by the back door. It could do so both in the way in which it measures norms and determines what counts as a sufficiently significant deviation from a norm, and also in how it singles out biological disadvantage as being the appropriate target for disease concepts. All of which leads rather nicely to Bill Fulford’s discussion of illness. One of the purposes of Fulford’s discussion is to uncover the logical geography of disease concepts, and to expose the value-laden judgments that go into them. He does this by bringing a good dose of Oxford-style ordinary language philosophy to bear on the debate. But we won’t hold that against him since some of his ideas are pretty interesting. As Fulford sees it, the odd thing about the debate between Szasz and Kendell is not so much what they disagree about, but what they agree about. In particular, the fact that they both seem to agree that the concept of physical illness is unproblematic. Physical illness is objective and uncontroversial; the concept of medical illness is the one that is subjective and contested. But why should this be? If you think about it, the concept of physical illness is just as value-laden as the concept of mental illness. Implicitly, judgments about physical illness are made relative to some ideal of health, well-being or proper functioning. All of these things can be controversial. For example, many people would say that old age is not an illness or disease; that it is a natural and inevitable part of human life. In saying this they make a value judgment about what is an acceptable course for a life to take. In recent years, several philosophers and transhumanists have called this value judgment into question. They have tried to reorient our perspective on ageing. According to them, it might be better if we viewed old age as an illness. At least then we might be motivated to find a “cure” for the great suffering it causes. What Fulford wants to know is why do so many people not see the inherently value-laden nature of physical illness concepts? To answer that question he appeals to R.M. Hare’s account of value judgments in Language of Morals (here’s where the ordinary language philosophy comes in). Take a simple statement lie ”this is a good strawberry”. In this statement, the value judgment is transparent: we are using the word “good” after all. But how is goodness typically determined? Hare argues that goodness typically gets cashed out in terms of purely descriptive or factual criteria. Thus, a “good” strawberry is one that is, say, “sweet” and “grub free”. 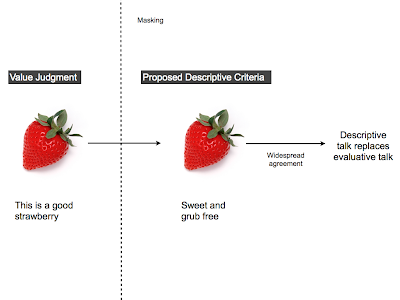 Over time, as agreement about the descriptive criteria for being a good strawberry spreads among the population, talk about those criteria replaces the value-laden talk. 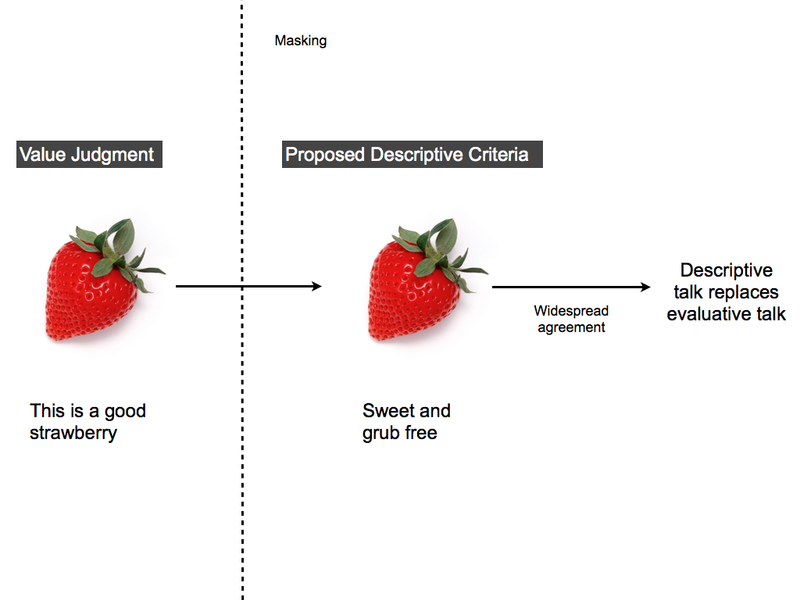 In other words, the statement “this is a sweet and grub-free strawberry” replaces the statement “this is a good strawberry”. The result is that the value-laden nature of certain concepts is masked or hidden by our discourse. This is depicted in the diagram below. Fulford’s claim is that, roughly speaking, this is what has happened in the case of many physical illnesses. In other words, the concept of physical illness starts life as an inherently value-laden one: you are physically ill if you fail to live up to some norm or ideal of good health or well-being. This gets cashed out in terms of descriptive or factual criteria. There is widespread agreement about those criteria. So in the end, the value-laden nature of the concept is masked by the discourse. The same thing has not happened in the case of mental illness, because there has been less agreement about the descriptive/factual criteria over time. This is a neat idea, and I think it does reveal something important about how value judgments can become masked in everyday discourse. Nevertheless, I think there are a couple of problems. First, it assumes too readily that there is widespread agreement about the descriptive/factual criteria for all physical illnesses. I can’t say for sure, but I imagine that this is not entirely true. There may be many physical illnesses for which it is true, but I suspect there are some that are highly contested. Second, it assumes too readily that there is widespread disagreement about the descriptive/factual criteria for all mental illnesses. This is certainly true in some cases, but the descriptive criteria for some mental illnesses (e.g. schizophrenia) have been pretty stable for some time (as far as I am aware). The Agency-Failure Account: For any condition X, X is an illness properly so-called if it involves a “failure of ordinary doing”. This is an interesting account of illness. It is inherently value-laden (illness= a failure) and it links the concept of a disease to what an agent would like to be doing. There is a question to be asked about what is and what is not a failure of ordinary doing. Fulford draws upon J.L. Austin's account (I did say there was a good dose of Oxford ordinary language philosophy involved…) which concerned being able to get on with things without too much effort. As I say, this is interesting, but also laden with problems of over and under-inclusiveness. Nevertheless, one thing I will say in its favour is that it is matches up nicely with liberal political values. What I mean is that within a liberal system, impediments to ordinary doing are of considerable importance. And it seems consistent with the core principles of liberalism to try to help people restore the powers of ordinary doing. But of course this illustrates how closely entwined political values can be with concepts of disease and illness. Some people would be uncomfortable with that entwining. I’ll end on that intriguing thought. In the final part of this series, I’ll look at some more meta-theoretical issues in this debate, before closing out by examining Jerome Wakefield’s attempt to define what medical illness in terms of biological function. John Danaher holds a PhD from University College Cork (Ireland) and is currently a lecturer in law at NUI Galway (Ireland). His research interests are eclectic, ranging broadly from philosophy of religion to legal theory, with particular interests in human enhancement and neuroethics. John blogs at http://philosophicaldisquisitions.blogspot.com/. You can follow him on twitter @JohnDanaher.